Used by the nurses to educate patients and families about Diabetes. The nurse brings the kiosk to the patient’s room and gives them a brief introduction and demonstration. 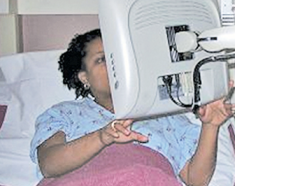 Patient receives a packet of information about the kiosk and how to use it. 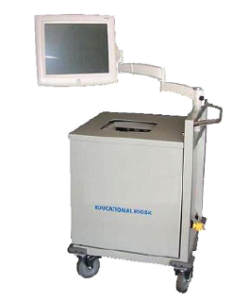 How does the Patient Education Kiosk work? The program is interactive so the patient at the end of each page needs to touch the screen to go to the next page or repeat the page. At the end of each module/topic, there is a patient evaluation of the program which consists of 7 questions. After completing the evaluation, the patient receives a summary printout of the information and a certificate of completion when the module/topic is complete. The nurse returns to review with the patient and answer any questions. The certificate is signed and placed in the Medical Record documenting the education. The nurse is free to attend to other duties. No delays in starting the education waiting for an interpreter if the patient’s primary language is Spanish. The nurse brings the Blood Glucose Meter to the patient as they are learning from the module. The hands-on activity increases learning. Information is always given in a consistent manner, no topic is missed. Summary print out is in a large font for easier reading when at home. Kiosk education experience is documented, recorded and consistent.